The sign at the Canadian border admonishes you to call the 1-800 number if you see any boats landing passengers and leaving, especially late at night. I’ll keep a sharp lookout for Navy SEALs and sneaky Canadians. 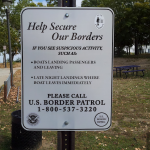 Americans can sleep well at night knowing brave men and women in Port Huron have the U.S. Border Patrol on speed dial. Escape from Camp 14 is a story from the other side of the world, literally and figuratively. There are ten laws of Camp 14 that everyone must memorize. Failure to comply with any of the ten have the same outcome: you will be shot immediately. Do not try to escape. No one escapes from this political prisoner camp. No one. If you try to escape, you will be shot. Prisoners must watch each other and report any suspicious behavior immediately. There isn’t a 1-800 number. Failure to do so means you will also be shot…immediately. Failure to fulfill your work quota for the day is punished with being shot…immediately. Not everyone in the camp is shot. Some prisoners are hanged. Shin Dong-hyuk’s mother and brother were hanged for trying to escape. Shin snitched on them and was forced to watch their hangings. Every prisoner in the camp was conditioned to be more faithful to the guards than their own families. A new prisoner arrives and Shin is to work with him, and spy on him. This new prisoner, unlike Shin, knows the outside world. Shin was born in the camp and knew nothing of North Korea or anything else outside Camp 14. The new prisoner had been to China and was sophisticated, and polite to Shin. He taught Shin that the prison camp was his cage. Shin didn’t snitch this time. He listened and plotted an escape with this new prisoner. Shin became the first person to ever escape from Camp 14 when he crawled over his friend’s dead body that smoldered on the electric fence around the camp. Shin managed to cross into China and enter South Korea, and told his remarkable story to Washington Post journalist Blaine Harden, author of one of the best books you’ll read this year. Canadians want a new bridge to Michigan and are willing to pay for it. A billionaire businessman on this side of the proposed bridge is fighting it with his considerable power and wealth. He is the owner of the bridge to Canada that’s causing problems for Canadians who dislike the congested traffic of truckers. He’s making one hundred million a year from the traffic across his bridge. A new bridge reduces his profit but will clearly benefit both Michigan and Canada. Boundaries are about being in control, finding the strike zone. Hall of Fame pitcher Don Drysdale had a reputation for sending hitters into the dirt with his knockdown pitch. His rule was that the batter can have the inside part of the plate or the outside but not both. Try to take more and down you go. In some places you’ll be shot immediately for trying to stretch your meager boundaries beyond the high voltage fence. Or the electric fence will make the final verdict on your fate as you lose your balance in the below zero temperatures and fall on the wire. Your buddy who was supposed to go first but also slipped before reaching the fence will use your dead body as a bridge to freedom and a book deal. Freedom, fame, and money can’t burn the bridge to his horrific past. He wants to blow up that bridge but can’t. The demons of the political prison camp stalk and torment him like the guards. In metro Detroit, perennially the worse metro area in the country according the BLS, something obvious as a new bridge requires a ridiculous amount of effort to persuade people to go for it. The opposition, funded by the billionaire and his high powered Washington consultants, preys on the ignorance. They can’t afford to go for it. The price of the unknown is too much. Every book has a signature passage for me. Escape from Camp 14’s is when the new prisoner arrives and Shin discovers his life in the prison camp isn’t normal. He now sees his world inside the camp as a cage that he must escape. He knows the odds aren’t good. But he also understands the price of staying in the camp. The most poignant passage in Argo wasn’t about the embassy hostages in Iran. It was when CIA officer Tony Mendez rescued one of their spies in Iran before the embassy hostages were seized. The Iranian official was terrified that he wouldn’t be able to fool the guards at the airport. The disguise that Mendez made for him was good. But as Mendez explains, the person must believe the story. They must buy into the cover story to the point it’s no longer fiction in their mind. It’s their true story. It’s their real identity. To get from point A to point B, they must believe to cross that bridge. If they fail to believe completely, they won’t be turned back like a trucker transporting cargo of women’s wear to a retail outlet. They won’t be stoned to death on the floor of the New York Stock Exchange for the treasonous act of delivering clothing out of season. They will sufferer extreme agony that will make them plead to be shot immediately. Mendez saw that this man was faltering psychologically. His disguise was good enough for him to make it safely into the boarding lounge. He was safe now. All he had to do was go on the plane, cross the bridge to freedom. But he didn’t get on the plane. Mendez was watching for him to just get on the plane. He was safe. Just walk onto the plane and he’ll be a free man. Mendez didn’t see him and took the risk of sneaking past the guards to search for him. He found him sitting on the toilet, hiding and shaking in fear. He was stunned when Mendez came into the bathroom. Mendez led him onto the plane at great risk to himself. Clay Shirky gave a popular talk for TED on how the Internet will transform government into more open access. The political prison camps won’t go down without a fight.